As the Universal Declaration of Human Rights turns 70, a new generation of human rights defenders are reinventing themselves to fight for old rights amid a new world order. Based not on declarations, charters and international bodies, but on the values which underpin them – justice, fairness, equality – they shun the language of their predecessors while embracing the same struggle…However, in the new realities of the 21st century, the mechanisms to promote human rights that grew out of the Universal Declaration are showing their age. Authoritarianism is on the rise across the world, with popular leaders cracking down on human rights defenders. 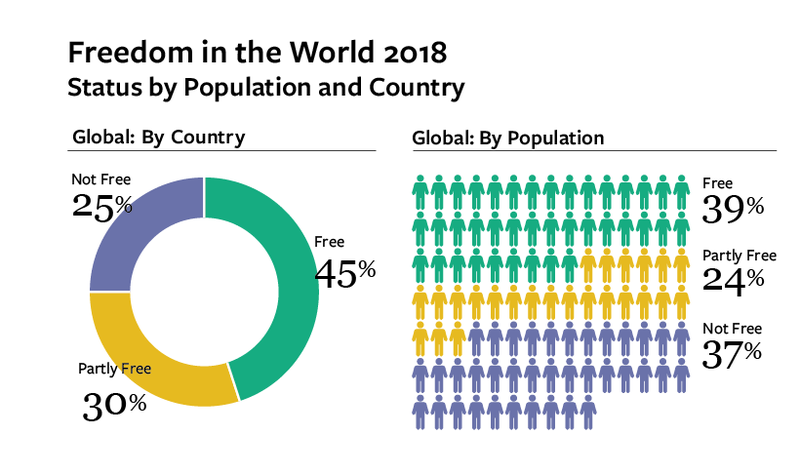 Freedom House found 2018 was the 12th consecutive year that the world became less free. Civicus, which specifically monitors the conditions for civil society activists and human rights defenders, found civil society was “under attack” in more countries than it wasn’t, with all post-Soviet countries (except Georgia) ranging between “obstructed” and “closed”. Troublingly, both the willingness and the ability of Western bastions of human rights are also on the wane. Inside the EU, talk of illiberal democracy gains traction, and internal crises divert attention away from the global stage. Perhaps unsurprisingly, throughout Eastern Europe and the former Soviet Union, younger activists and civil society are giving up on western governments and international organizations to advocate on their behalf. Pavel Chikov, director of the Agora group, said recently that, “Russian human rights groups no longer have a role model,” calling the liberal human rights agenda “obsolete”. Growing disillusionment has led many rights groups to shift away from appealing to outsiders for support. Younger campaigners no longer frame their work in the traditional language of human rights, and many do not even consider themselves human rights defenders. Instead of referring to international agreements violated, they focus on solving practical problems, or creating their own opportunities to advance values of equality, justice and fairness. Formats too have changed. Throughout the region, tools used by civil society to raise social consciousness are becoming diverse, dynamic and smart. Instead of one-person legal tour de forces, genuinely grassroots, tech-powered, peer-to-peer or horizontal networks are proving effective. Media, music, art, film, innovative street protests, urbanism and online initiatives focused on local communities are coming to replace petitions and international advocacy. Team 29, an association of Russian human rights lawyers and journalists, is among the most successful of this new generation. It has repositioned itself as part-legal aid provider, part-media outlet. Its website offers a new mix of news on ongoing trials, animated online handbooks for protesters, videos on torture and a new interactive game telling young people how to behave if they are detained by police. Azerbaijani activist Emin Milli also embodies this journey of wider civil society – turning away from the international towards local solutions. In the early 2000s, he was a traditional human rights defender, successfully using international mechanisms, such as the Council of Europe to assist political prisoners. The key to Meydan’s success is its accessibility. Milli says: “We do stories about ordinary people. Real Azeris who have everyday problems.” Through its smart coverage, investigating and highlighting how injustice affects these ordinary people, and not referring to UN-enshrined rights and responsibilities, Meydan is “giving a voice to people who fight for women’s rights, people who fight for political rights, for civil liberties, and everybody who feels they are voiceless”. Music, too, is increasingly being used as a vehicle to realize human rights. Though he might shun the label, Azeri rapper Jamal Ali is perhaps one of the country’s most well-known “human rights defenders”. His songs about injustice and corruption regularly go viral, raising national and international awareness in the same way a statement at the UN General Assembly might have done three decades ago. In a 2017 hit, he highlighted how two young men had been tortured by police and faced 10 years in prison for spraying graffiti on a statue of former president Heydar Aliyev. In response, the regime arrested Ali’s mother, demanding that he remove the video from YouTube, only to ensure that Ali’s song went even more viral among Azeri youngsters. Gender equality and women’s rights is also being advanced through unexpected new champions. In Kyrgyzstan, 20-year-old singer Zere Asylbek sparked a feminist shockwave earlier this year with her video Kyz (“Girl”). “Don’t tell me what to wear, don’t tell me how to behave,” she sings, bearing her top to reveal her bra. Seen by millions, the Kyrgyz-language feminist anthem has set off a new #MeToo debate in the Central Asian country, where many young women are still abducted, raped and forced to marry. In the wake of the video, a first “feminist bar” is about to open in Bishkek. Other feminist videos have been used to directly address the issue of bride-kidnapping, with animated cartoons being used as part of local campaigns to change mindsets in a conservative society. Perhaps most excitingly, an all-female team of 18 to 20-year-olds is building the country’s first micro-satellite. “Girls taking us into space is the best message against sexism,” says Bektour Iskender, whose news site Kloop initiated the project. He says the girls’ project has a deep social mission, promoting national pride and the country’s return to advanced technological development. These examples – and countless more – show that civic groups see no value in lobbying an increasingly disinterested West and sluggish international organizations. Instead they focus their energy where they can achieve real, concrete change within their own communities. Their campaigns are grassroots-led and use local languages and issues their communities understand. They target specific audiences, often using technology and creative formats, with a heavy dose of visual and artistic elements. Addressing discrimination, environmental protection, corruption, health issues, women’s rights, they speak not about the failure of their states to abide by international accords, but about common dignity and life opportunities, addressing people on a direct human level. Clearly, the values of the Universal Declaration of Human Rights are still valid, but their approach and the packaging have changed. “We all want to change the world,” says Sergey Karpov of the Russian online media and philanthropic platform Takie Dela. “Today communications are the best way”. Let’s celebrate the International Human Rights – and Human Rights Defenders Days in the city of peace and justice! Take the opportunity to learn from their experiences and share your own. Meet human rights defenders, debate about your rights, think out of the box and dance at the Human Rights Ball. Discover the defender or rebel in you! Download the flyer. Portraits of Dutch and international human rights defenders by photographers Anette Brolenius and Daniella van Bergen. Watch this documentary and be part of a global one year campaign for respect and equality. With: Nighat Dad, the Pakistani winner of the Dutch Human Rights Tulip Award 2016. What makes a human rights defender? With: Nighat Dad, Hans Jaap Melissen, Saskia Stolz en Hassnae Bouazza. John Legend writes for Amnesty International’s Write for Rights campaign. Award-winning singer/songwriter John Legend joined Amnesty International USA as part of its annual Write for Rights campaign. For Human Rights Day 2014 the Write for Rights cases included Chelsea Manning, victims of gun violence in the USA and Brazil, and women and girls of El Salvador impacted by the country’s abortion ban. Writing is a transformative experience. I write songs to express myself. I write songs to give hope. I write songs to heal the hurt. I write because living free from violence is a human right. I write because leaders who let their police forces jail, beat and kill people who are simply, peacefully trying to express themselves need to know the world is watching. I write because I take injustice personally. Because there are no throwaway lives. I write because silence feeds violence. I write because lyrics change music, but letters change lives. A few days ago Erykah Badu on Twitter remained obstinate over her scheduled performance in The Gambia. Other bloggers (e.g. http://yafri.ca/erykah-badu-faces-criticism-over-her-performance-for-gambian-president/) are adding to the noise by pointing out that President Jammeh’s regime consistently cracks down on the opposition and the media. In its submission to the Universal Periodic Review (UPR) of Gambia, the human rights organisation, Amnesty International, stated “Since Gambia’s first Universal Periodic Review (UPR) in 2010, the human rights situation in the country has deteriorated. The government continues to stifle freedom of expression and commit other human rights violations with impunity.” An online campaign has been put in place by web users to enlighten the singer about the Gambian dictator. See Facebook and twitter campaign of disapproval [@fatbellybella]. HOWEVER in the meantime it seems that Erykah Badu has decided NOT to attend Gambia’s much publicized Roots Homecoming Festival. Especially Gambian dissidents based in the United States have repeatedly prevailed on the Grammy winning artist not to attend the festival. ..Interestingly the singer’s likely absence has angered Gambian artist Gibou Balla Gaye, who goes with the street name Gee. Perhaps good to note here that Gee is the son of Balla Gaye, Gambia’s former Finance Minister. Anyway it is nice to be able to point to better examples, such as Celina Jaitly in India who tackled the taboo of gay relations. The United Nations Free & Equal Campaign published on 29 April 2014 this first-ever Bollywood music video for gay rights, featuring Bollywood star Celina Jaitly: https://www.youtube.com/watch?v=lihVCIFamb0 [sorry you have CONTR/click as the embedding does not work – but worth a view!!]. On Monday, Miss Badu tweeted: “I have no political affiliation to anything besides my AFRO. However, I will stand with any group opposing injustice. But not on twitter.” She then retweeted a comment by a man named Joe Black that read: “[Erykah Badu] owes NOBODY an explanation of why she performed in Swaziland. She’s a professional artist, not some phony rights defender.” Remarkably on Tuesday, Miss Badu tweeted that she was not paid for the Swaziland event. via Human rights groups demand answers after Erykah Badu performs for Swaziland dictator – Washington Times. In Foreign Policy magazine of 19 March, Alex Gladstein has written a very complete and moving story about the great Cameroonian musician, political prisoner and human rights defender, Lapiro de Mbanga. He died of cancer this past Sunday, 16 March 2014, in Buffalo, New York. Known as “Ndinga Man” to millions of Cameroonians, Lapiro escaped President Paul Biya’s regime in 2012, after three years of political imprisonment. He received asylum in the United States. Last week I blogged about the mixed record of star power (https://thoolen.wordpress.com/2014/02/10/star-power-and-human-rights-a-difficult-but-doable-mix/) and it is nice to add a positive example: Rihanna. 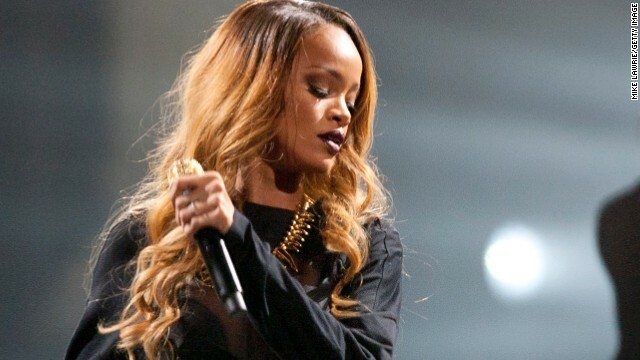 On 16 February 2014 Faith Karimi and Neda Farshbaf wrote for CNN how pop star Rihanna is adding major star power to the campaign for gay rights in Russia. The singer behind hits such as “Disturbia” and “SOS” tweeted a photo of herself wearing a hat emblazoned with P6, short for Principle 6. This campaign speaks out against Russia’s anti-gay propaganda law as the nation hosts the Winter Olympics. And Rihanna has 34 million followers on Twitter! The photo links to her Instagram account, which has about 12 million followers. In subsequent tweets, she posted links to other articles highlighting the issue. Rihanna adds star power to P6 campaign for gay rights in Russia – CNN.com.